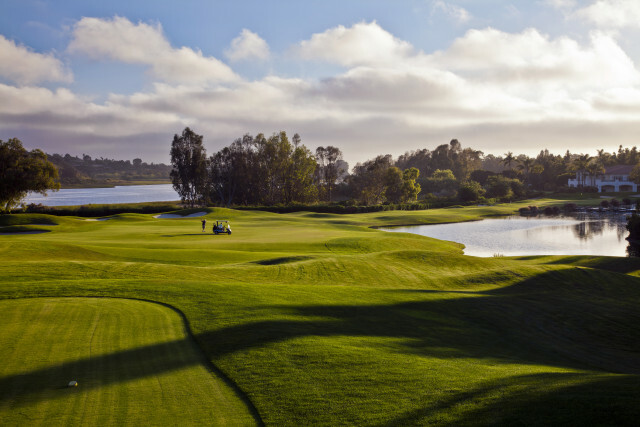 Aviara Golf Club in Carlsbad, the annual host of the LPGA’s KIA Classic, is routinely rated one of California’s top resort courses and is the only Arnold Palmer design in San Diego. Impeccable landscaping and being situated next to the tranquil Batiquitos Lagoon define the property, which also features dramatic elevation changes on the front nine. Each hole is truly a unique experience at Aviara. The property’s amenities include: a two-story, 32,000-square-foot Spanish Colonial clubhouse and the adjoining Argyle Steakhouse with indoor and outdoor balcony seating; showers, locker rooms; an upscale golf shop, driving range and an oversized practice putting green. For those unfamiliar with Aviara Golf Club, we provide the following five highlights of the course and overall playing experience. On the first tee, the starter welcomes you to an 18-hole botanical garden, and that’s exactly what Aviara Golf Club is. An amazing array of plants and flowers accent every hole. The course is truly a visual treat. There’s always something in bloom at Aviara. Aviara is known for having greens the size of helipads. Get ready to stroke some of the longest putts you’ve ever hit if you can’t knock it close. The greens are the course’s defining characteristic, which is funny considering they were originally a construction mistake. The construction crew doubled the size of the greens on the front nine. Rather than tear up the greens, course officials chose to double the size of the greens on the back to match. The result is what you might term a happy accident, as players now look forward to the sizable undulating greens at Aviara Golf Club. The strength of the course is its par 3s, which many consider as a group to be the best in San Diego. Three of the four feature carries over water and are, again, impeccably landscaped. No. 3, a short par 3 with ponds in front and right, is considered the course’s signature hole. No. 6, the only one without water, is the toughest of the bunch. It’s a long uphill, a nearly 200-yard carry, to a blind green. An ocean crosswind can complicate matters even more here. The two par 3s on the back are all carry over water, with No. 14 being from an elevated tee box. You will want an iron and a camera phone on the par 3s because they are truly beautiful golf holes. Aviara loves to tempt your sweet tooth. There are fresh-baked cookies available next to the putting green and a special treat waiting for you on the course. The course marshal usually greets you on the 8th green with a bucket of Tootsie Pops. Hopefully you’re walking off the green with birdie, but if not, you’ve at least go a consolation prize. Besides having the best par 3s, Aviara may also boast the toughest closing hole in the county. This dogleg right offers a beautiful view of the Batiquitos Lagoon from the tee. Savor the view because you might not like what happens next. There’s water right, OB left and likely an ocean breeze in your face. Ideally, you want to place you tee shot just inside the fairway bunker on the left and we recommend clubbing down to a 3-wood if necessary to do it. You just want to be in the fairway here and not the water. Then you’ve got a long, narrow approach into a green where water is still in play on the left, cascading down a gorgeous waterfall. Par is a great score here, but here’s guessing it’ll take you a few rounds to card one. After playing this course nearly a dozen times, I’m still waiting. This entry was posted in Golf & Sports and tagged north county coastal by Corey Ross. Bookmark the permalink.